The .22 Rim-Fire rifle is in a class by itself, both as to price and for performance, and therefore deserves some special discussion. It. has some troubles all of its own, so we shall devote some space to them. Dirt lodged behind the extractor may hold it back out of place, and make it fail to function. "spring" to it and is not too soft If it also has a coil-spring behind it, make sure the action of this is positive and snappy, by pressing or drawing the extractor hook outward and then letting it snap back into its slot. If it appears to be sluggish, remove the pin holding the extractor in place, then remove the extractor and the coil-spring and clean out the hole in which the spring seats, also clean the spring thoroughly. It is seldom that the coil-spring is not of the proper temper, but this may happen, so press it together between your fingers and see that it springs back readily to its full length. If any of the coils of the spring are out of line, discard the spring and put in a new one, for it is almost impossible to straighten it up. Showing correct (A) and incorrect (B) shape to hook of rim-fire extractor. face of the hook should have a rake to it, meaning that the edge of the hook should be closer to the face of the breech than the rest of the hook, so that the angle between the hook and the body of the extractor is less than a right-angle. An angle of 80 to 85 degrees is about right. If the edge of the hook is very slightly broken away or rounded, file the rear face of the hook with a fine three-square file until the rear face is perfect clear out to the edge, then just remove the wire-edge left by the file on the edge of the hook with a fine carborundum stone or with a white Arkansas stone. The carborundum stone can be bought from the Carborundum Co. of Niagara Falls, New York, and the white Arkansas stone from the Norton Co. of Worcester, Mass. These square and triangular stones cost about 50^ each. If the edge of the extractor is badly worn or has quite a piece broken from it, the only thing to do is to replace it with a new one. If the factory product is not readily available, a new one can be filed out of a piece of spring-steel. This steel is readily obtainable anywhere, for if your locality does not contain a shop which makes automobile springs or replacement leaves for them so that you can buy annealed spring-steel, get a piece of broken automobile spring leaf from a garage, heat this to a moderate red-heat and then bury it in slaked lime to cool. This will anneal it so that it can be easily cut and filed and after it is filed to shape, heat it to a low cherry-red and quench it in a light oil to harden, after which polish it and heat it slowly to a deep blue and quench it again in the oil to give it the proper temper. Correct ignition is a main factor in the development of the potential accuracy of any .22 rim-fire rifle and is a matter which should receive constant attention from the rifle owner. These drawings on Plate XIII are intended to illustrate certain correct principles of rim-fire ignition and also to show certain common faults of action fitting and adjustment which will seriously affect this vital matter of accuracy. It shall be callcd to mind that the "anvil" of any center-fire primer is a part of that primer itself—being contained in the primer cup, in the case of our American-type primers-—or being formed in the primer pockct of the case, with the Berdan-type primer. However, in any rim-lire rifle this "anvil" is an integral part of that riile—being formed by the breech-end of the barrel—that portion of the counterhored recess around the mouth of the chamber which accommodates the rim of the cartridge case, and which lies directly under the point of the firing-pin. In the Plate opposite, this "anvil" is indicated by the letter "X." Figure "A" shows .22 rim-fire operation under proper conditions. Notice that the cartridge is fully seated into the chamber, with its rim solidly up against the rule's "anvil" so that there is no movement or lost-motion when the fhing-pin drives forward. Such condition gives instantaneous and consistent ignition for every cartridge fired. The gunsmith should sec to it that all tolerances and adjustments—both in firing-pin and extractor—establish this correct relation of parts. The rifle's owner should see that this situation is maintained—iy keeping grease and dirt out of the rim-counterhore and from around the extractor, and by avoiding any battering-down or cushioning of the "anvil." Figure "B" illustrates a common fault of many .22 falling-block rifles, one which seriously affects their accuracy. Here we have a condition whereby the cartridge rim cannot bear firmly against the "anvil" —causing erratic ignition and hang-fires. This is often due to dirt or heavy grease lodging behind the extractor» or it can be caused by a bent extractor—either of which fault prevents the cartridge from being fully seated in the chamber. Both faults can occur in a properly adjusted rifle after it has left the maker's hands—and their correction calls for either a thorough cleaning or a new extractor. Figure "C" illustrates a similar condition, where the cartridge is prevented from being properly seated on account of an extractor which is a trifie too thick. A bit of filing or stoning-down will correct this fault. Figure "D" shows the same condition in a bolt-action rifle. Here the cartridge is prevented from proper seating by an extractor which is too long. 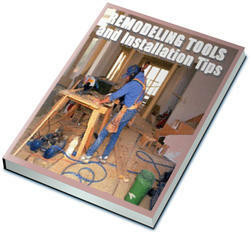 The remedy is to stone or file off a bit from the end of the extractor—or to file out the hook slightly. Dirt or hard fouling accumulating in the rcccss for the extractor hook can cause this same fault—so keep this rcccss dcancd out at all times. Figures "E" to "J" illustrate proper and improper firing-pin profiles. "E" is a poor one—too pointed and edge too sharp. Will cause pierced cases, with accompanying gas-bursts. "F" is also a pour one—striking face too narrow and too sharp. Will cause split and burst case-rims. "G" is a good shape—but care should be taken to stone-off the sharp edges, just strike a slight bevel all around. "H" is proper for the round-end firing-pin, but this is a poor shape to use for rim-fire cartridges. "I" is proper profile for the round, flat-end firing-pin—but be sure to strike-off the sharp edge around its point. "J" is a poor shape to use—safe, but not an efficient profile. reamer with plenty of cutting oil, such as lard oil or black sulphur oil, but be careful not to force the reamer, use it gently or you may gouge the chamber or stick the reamer and break it. size, so that the rod will screw very tightly into the threads tapped in the barrel. Make sure that the piece of drill-rod bottoms perfectly in the bottom of the counterbore in the barrel, then set it up as tightly as 3'ou can and cut it off, facing it down to the rear end of the barrel. With the barrel still centered in the lathe, drill a center-hole in the piece of drill-rod, using a combination center-drill, then drill out the length of the chamber with a %6" or 1%4// twist drill, after which bore it with a small boring tool, which you can grind to shape from a piece of high-speed steel lathe cutting bit, until it is just a few thousandths of an inch below chamber size, then use the chambering reamer to finish it to size. Once in a while you will encounter a new gun with the chamber so large that the fired case expands beyond its 4'spring-back" point, so that it grips the chamber walls very tightly. This usually does not give much trouble in a rifle where you have ample extraction power, but it is a tough break when it occurs in a revolver where six or more fired cases are extracted at once. The gun, of course, should be returned to the manufacturer at once, but if this is not feasible, then try brass-case ammunition, as the brass case is often stiff enough to have more spring than other types. Extraction difficulties are one big reason why guns should be thoroughly cleaned each time they are used, regardless of what the ammunition manufacturer tells you about his noncorrosive ammunition making cleaning unnecessary, for dirt that collects in a chamber may be of any nature, and it may readily absorb moisture so that the chamber is rusted and pitted, and a barrel with a ruined chamber is almost as badly ruined as one with pock-marked rifling. I prefer a brass or bristle brush of the Parker type, as these brushes will remove dirt better than a patch does. If the brush is dipped into a good cleaning solvent or oil, it will leave a coating of it in the chamber and rifling, then a dry patch run through the barrel before the gun is used again will remove anything loosened by the action of the oil or solvent. The rim-fires, especially the .22s, are very susceptible to ignition troubles, not necessarily misfires, but hang-fires and uneven ignition. A great deal of this is due to the ammunition. The primer space in a .22 rim-fire case is very small, the primer mixture is not always evenly distributed around the rim, and spots where it is thin may easily cause a slight hang-fire. Also the modern high-velocity brass case is pretty stiff and the firing-pin blow on many of the older rifles, and on some of the new ones, is a little too light for best ignition. This is sometimes caused, in a new rifle especially, by heavy grease inside the bolt barrel, so that the firing-pin is cushioned against the inside of the bolt head by this grease. A new rifle should always be examined at this point to make sure there is no grease inside the bolt. A very light oil is the only lubricant that should be used upon the firing-pin or coil-spring inside the bolt. Poor ignition from a light or misplaced firing-pin blow can be detected by examining the impression made by the firing-pin on the head of a cartridge. To give the best ignition, this impression should be .015" or more in depth. If the firing-pin impression looks to be considerably less than this in depth, out on the cartridge rim itself, start to hunt the cause right away. First, make sure your bolt is clean of grease and dirt inside the head as mentioned above; next, make sure that the firing-pin protrusion from the breech face is sufficient. Sometimes a firing-pin is shortened by wear on the point and when this occurs it can often be lengthened by cutting back the shoulder of the pin slightly, thus giving it a longer point. If the pin is hard, it must either be ground back or be softened by heating to a red-heat and burying in slaked lime to cool, after which it may be filed or machined in the lathe. It is then rehardened by heating to cherry-red and quenching in a light oil, after which it is polished and then heated slowly until it becomes blue in color and then quenched again in the oil to temper it. Hardened pins can be chucked in the lathe and ground back slightly in the body with an electric tool post grinder, or this grinding can often be done on an automobile valve-grinder of the better type often found in garages. If the firing-pin protrusion is sufficient, examine the rim of the chamber where the case rim is supported against the firing-pin blow (its "anvil") to make sure that the rim is not dented at this point, as in some rifles, especially older types, the firing-pin is long enough to strike the chamber rim if the rifle is snapped without a cartridge case in the chamber. If the rim is in bad shape at this point from this cause, the remedy is to set the barrel back one thread, cutting it off and deepening the chamber the required amount. After this has been done, the firing-pin should be shortened so that it does not quite strike the rim when the empty gun is snapped. Dirt in the counterbore in the end of the barrel for the case rim may cushion the blow of the firing-pin enough to cause hang-fires or misfires, so make sure there is no dirt or heavy grease at this point. Grease may easily collect there when greased cartridges are used, and the autoloading .22s are sometimes bad offenders from this cause because powder fouling blows back into the action with this type of gun and grease at the rear end of the chamber will pick up this fouling, so the rear end of the chamber should be cleaned after you are through shooting the gun for the day. In examining the firing-pin impression on the head of the fired case, check carefully to see where the firing-pin strikes. If the firing-pin impression extends clear out over the edge of the rim, and your rifle gives ignition troubles, try narrowing the pin enough at the outer side so that it strikes just inside the edge of the rim, for the rim is very much stiffer at the edge, due to the double thickness at this point, so a rifle on which the firing-pin blow is a little too light to give good ignition when the pin extends over the edge of the rim may give good ignition if it is narrowed enough to strike just inside the edge of the rim. 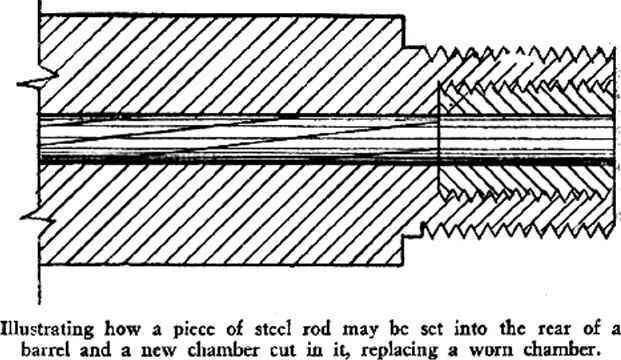 The round, flat-ended firing-pin has to strike a heavier blow to give as good ignition as the rectangular, so called "chisel-shaped" flat-ended firing-pin, unless the diameter of the pin is very small, for the greater part of the impression is made upon the case-head inside the rim and this tends to cushion the blow. 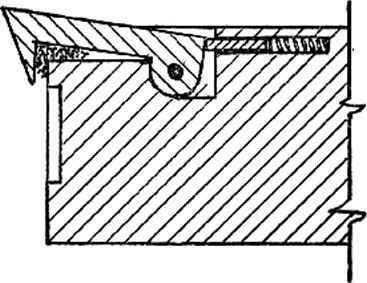 This may be corrected in two ways; either by grinding off the side of the firing-pin toward the center of the case, to reduce the amount of pin impression on the case head inside the rim, where it does no good; or by grinding the sides of the pin parallel, to narrow it to the chisel-shape, thus concentrating the force of the blow. In making any change in the shape of the firing-pin point, the edges of the flat point should not be left sharp, but should be slightly rounded with a fine hand-stone like the white Arkansas stones. Never make a rounded-nose firing-pin that is a hemispherical-shaped end like a center-fire pin for use on rim-fire cartridges, for this is almost sure to give poor ignition. The end of the firing-pin should be flat. In some of the older make rifles of the falling-block types, the firing-pin strikes the case rim at the point where it is supported by the extractor. This nearly always leads to ignition troubles, due to the fact that dirt often gets behind the extractor and cushions the firing-pin blow, also very often the extractor is slightly below the level of the end of the barrel so that the rim is actually not supported by the extractor against the firing-pin blow. The best correction for this is to make a new firing-pin, with the nose in a different position so that it strikes the cartridge rim where it is solidly supported by the end of the barrel. The old firing-pin hole in the breech-block can be filled up by tapping it out with a fine-thread tap and screwing a piece of drill-rod into the hole tightly, after which the rod is cut off and filed down flush with the face of the breech-block. 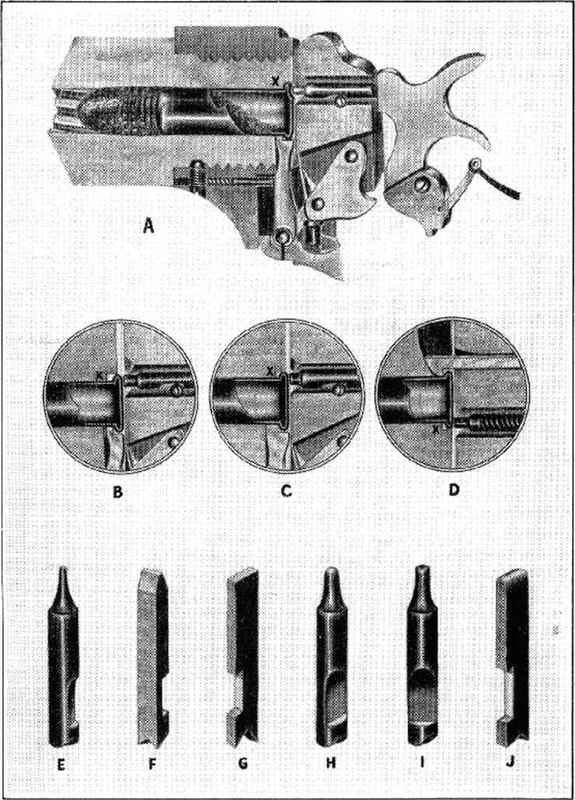 At any time a cartridge case head blows out, examine the inside of the breech-block or bolt for small pieces of copper or brass that have come back through the firing-pin hole, as these will often cause enough friction to cushion the firing-pin blow or may even roughen up the firing-pin enough so that it binds in the hole in the bolt or breech-block. Of course, weakened main-springs will always be a source of ignition trouble and the remedy is to replace the weakened spring with a new one. Does haenel falling block rifles have threaded barrels? Why would rimfire chamber be dented by the extractor? How to repair rifle extractor? How to repair rimfire breech? What causes 22 rim fire case to rupture? How to fix rough chamber on rifle? Are firing pins slightly angled for rimfire? How to remove a rimfire firing pin from a rifle? How to repair a .22 rimfire rifle bolt? Can a 22 rimfire barrel be shortened?